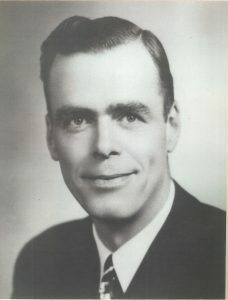 Horace Greenfield was born in Winnipeg, Manitoba and moved to Simcoe in 1952, where he purchased a car dealership. His legendary curling career in Simcoe started at the Talbot Street Arena this same year. Horace spearheaded the proposal to the Fair Board that resulted in the move to the present curling facilities. In 1955 the Simcoe Curling Club was opened under the direction of Horace Greenfield, President. Appropriately, he had the honour of throwing the first rock to open the new club. When Horace started the new Simcoe Curling Club, he taught himself the art of making curling ice. He passed his knowledge on to others. Most notable was Marcel DeWitte who learned the trade from Horace at the Simcoe Curling Club. Marcel went on to become the head ice technician for the Ontario Curling Association. Marcel made ice for all the important Provincial and National curling finals and was often called upon by countries all over the world to make ice for their top events. Marcel’s fame and world recognition as a maker of fine curling ice started in Simcoe under the direction and watchful eye of Horace Greenfield. Horace retired from active curling in 1984 but his love of the game never diminished. In fact, while Horace was vacationing in Florida, his family would tape all major men’s and women’s curling events and forward the tapes to him. Horace would often be found at the Curling Club on Sunday mornings helping high school students and conducting clinics for new curlers. For his passion for the game, his tireless dedication to the mentoring of new curlers and much more, Horace Greenfield was inducted into the Norfolk County Sports Hall of Recognition.